Fp10 Flight Pack Air Data Engine.- System connections. Accurate air data is essential for calculation of reliable final glide predictions and speed to fly. Wind strength/direction is also a primary input for pilot tactical decisions made during flight. Flight Pack can supply the PPC software with all data required to give true values of wind speed and direction. Flight Pack calculates True Air Speed (TAS) from Pitot/Static Barometric altitude and Outside Air Temperature (OAT). 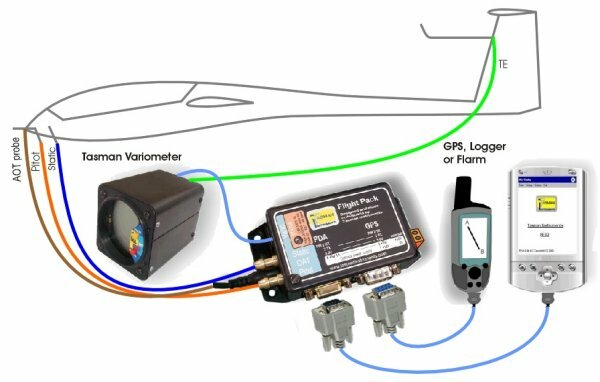 True Air Speed, Barometric Altitude and Variometer values are added to NMEA GPS data from a variety of GPS sources such as a handheld GPS, Data Logger or Flarm. Data rate is adjustable and smart software adjusts for optimum timing to accommodate a wide variety of GPS NMEA-0183 compliant devices. Note: Flight Pack supports Task uploads from PC to Data Logger.